EN50126: Railway Applications– The specification of Reliability, Availability, Maintainability and Safety [RAMS]. EN50128: Railway Applications — Communications, Signaling and Processing Systems — Software for Control and Protection Systems. EN50129: Railway Applications — Communications, Signaling and Processing Systems — Safety related Electronic Systems. EN50159: Safety Related Communications for Rail Transit. EC61508: Functional Safety of Electrical/Electronic/Programmable Electronic Safety related systems. IEC61511: Functional Safety– Safety Instrumented Systems for the process industry sector. IEC60987: Nuclear Power Plants — Instrumentation & Control important to Safety. Hardware Design Requirements, computer based systems. IEC6138: Nuclear Power Plants — Instrumentation & Control important to Safety. Software for Computer based systems [Cat B or C]. DO-254: Design Assurance GUidance for Airborne Electronic Hardware. 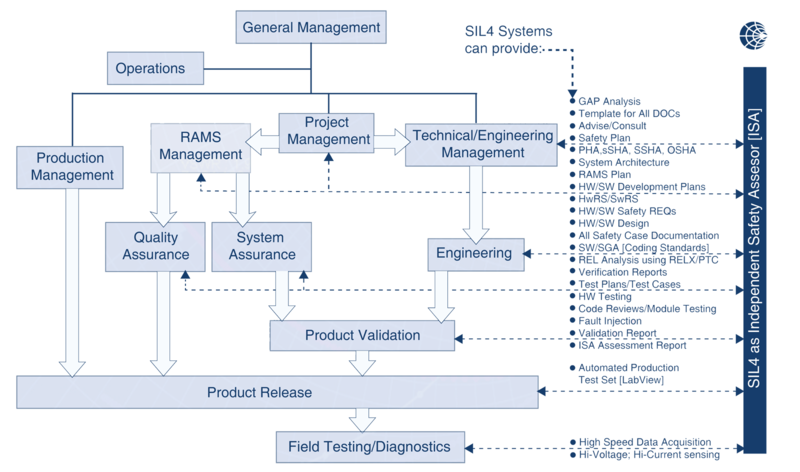 DO178B: Software Considerations in Airborne Systems and Equipment Certification. FRA 49 / CFR Parts 209, 234 and 236: Standards for Development and use of Processor Based Signal and Train Control Systems. Our Electrical Engineering Consulting Services include solutions for all computer controlled embedded systems. If your needs are High Reliability and Availibility instead of Fail-Safe, Mission Critical Design, we can help you Lead The Field.